Taking over our Wednesday-Thursday timeslot for channel 3 is Fah Krajang Dao, the conclusion to Sarm Taharn Suea Sao series, aka The Three Musketeers Series, starring Matt Peeranee and Boy Pakorn. In this premier episode, we follow Meekana’s life, what makes her tick and how she became a crime reporter for Siam Sarn. Much to her chagrin, she gets assigned to write a charity fashion show column where she meets Chief Police Inspector Heran, who becomes quite smitten with her. On top of that, she gets a new, young visitor in town whom she must take under her wing. Lots of changes and new additions for our heroine, let’s see how she handles them all. We open up in a dojo where Meekana is a brown belt, sparring with her partner. Her voice appears in the background, claiming that ‘no one could imagine that a woman like her (Meekana) could specialize in the crime division.’ She is referring to the misconception about her ladylike and sweet demeanor, which catches everyone off guard. Even her future boss at Siam Sarn, who takes a gander at her application, is surprised at her intentions, but Mee is determined to prove that she is capable of being a crime reporter. She even prefers to wear eyeglasses to tone down her beauty. Lol, well at least she knows she’s pretty. We are taken to present time where Mee is assigned her new task: the charity fashion show. Her younger counter part, Matt, could not cover the story as she is in Phuket acquiring the scoop surrounding KhetTawan, and since the charity is run by an anti-drug trafficking group, the boss decides Mee is best suited for it (despite our girl’s thought to the contrary.) He tries to smooth it over with the idea that she should use a break and write “pretty” stories for once. Ha. He encourages her to be open minded because there is always something interesting embedded in every story. Mee is at a self-defense class, where we hear her deepest desires, to liberate women from prostitution. This desire stems from her childhood, a painful story in which she withholds from people. She meets her two musketeers at their favorite coffee shop later that night, and they exchange thoughts surrounding the challenges that female reporters face: finding a man who is worthy of their character. Waree believes that it is best being single, Matt doesn’t think they could find a prospective life partner in their line of work, but Mee says that they are still young and should focus on work first, and if they choose a “man,” than said “man” should be meaningful to them and vice versa. Because love to Mee, should arise from understanding not infatuation. A man arrives in a motorcycle, clad in his gear and looks to be in a deep illegal exchange. Undercover cops hide behind the bushes, awaiting their cue from the man. But the bad guy hears a phone ringing (just the perfect deterrence) and he makes a run for it. But he doesn’t get too far as the man catches him, and his own gang does a drive by to eliminate him from ratting them out. When Mee arrives home, she receives a letter from a dear auntie. Her aunt is currently in England, assisting her friend in opening a restaurant abroad. This particular aunt is the only remaining relative from her father’s side, who raised her singlehandedly. We get a backstory of how Mee was created. Her mother was impregnated by her father who refused to take responsibility and ran away, leaving his sister, the teacher to take responsibility of the baby. Her own mother was forced to be married to a local man, so her auntie took Mee to be raised in a different province when she was two years old. Her mother thereafter had a son and two other daughters. It is sad that other kids have parents but she doesn’t- she only has a strict auntie who teaches her to be a real lady- but doesn’t offer any love or warmth that she needed. Their relationship comes to a head when Mee is a teenager and she confronts her auntie for not loving her because she’s not her real kid. She decides to go stay with her mother instead, because she can’t fathom living with a cold woman. Ah, but this decision changes her completely. She arrives at a farming province to see her mother, and meets her step family who leaves little to be desired: her step dad says that she’s frumpy and who would want her? It turns out her father is a scout for the prostitution business in that province. He brings a lady pimp to evaluate Mee, without her knowing, and the scout thinks she will be very popular. (omg) Her mother could not stop him. Mee refuses and abhors the older man for his disgusting thoughts and profession. She launches herself at him, but gets slapped and abused instead. The son watches from the door, smiling at his father’s demonstration. Later we see just how poisonous he is, he tells Mee that every other girl in the village is “sold” so what makes her think she is special? The life with auntie doesn’t seem so bad after all. That night she tries to run away, her mom spots her sneaking out and hands her an envelope with money, her auntie had this all figured out. She stands before her strict auntie in Bangkok and realizes she misunderstood the older woman all this time. At present time, Mee is thinking about her auntie, each letter she writes is very similar to one another: short, precise, necessary. It is as if she writes just to write, but to Mee, it still means a lot. The boss happens upon our Chief Police Investigator Heran (which we will call Sarawat Heran) and the boss asks for one of his reporter to participate in a recent case of human trafficking. Sarawat Heran believes it might be too dangerous, but misinterprets that the reporter would be a guy, and that the case is relatively mild, so he reluctantly agrees. The boss just goes along with it, in case Sarawat changes his mind. During that case, where a man is trying to sell off two girls to a je (Chinese for older sister, whom Mee is dressed up as,) Sarawat Heran encounters our nang’ek, but he thinks she is a transgender. At first she thinks he’s one of the baddies because she didn’t have her eyeglasses on, and proceeds to whip him with her stick. But once she finds out he’s a cop, she apologizes profusely, but is shocked to hear him say that she’s a gay man. Ha. Her team have a good laugh about it later as Mee tells them that she won’t be able to face him next time. Waree figures that Mee is secretly fancying the Sarawat, but Mee says that she didn’t even get to see his face. She worries about a case of abusing the police officer. Mee has a quiet meal with her noodles as she reads a letter from her younger brother, Tamrong. She rolls her eyes at him trying to be sweet. He thanks her for always sending the family money and that their mom misses her. Her nephew, Sintih who is ten years old now, and has gotten into some trouble with his friends at school (he was sent to study in the bigger province because Tamrong wants him to be as smart as his auntie.) But now Tamrong is at wits end on what to do with his son, so he asks Mee to find a good school in Bangkok for him and help support him. Maybe Tamrong is turning over a new leaf? Mee and Waree are shopping for sunglasses and they coincidentally run into Sarawat, who was also shopping at the time, but doesn’t recognize her immediately. Small world, do we always run into our soul mates at random, mundane places? Heeh. As Mee sees Waree off, Waree teasingly says that during the time that she’s away (she’s doing a scoop in Trat, remember? Ah, it was just yesterday we were spazzing over Waree and Khun Sama!) she hopes that Mee falls in love. Sarawat’s Range Rover pulls into Siam Sarn’s parking lot where he pays a visit to the boss. He came to remind him of the upcoming charity fashion show and the boss tells him that he’s definitely going- then he asks whether ‘the woman with two genders’ is going too (lol.) Embarrassingly enough, he learns that the transgender he mistaken for at the undercover case, is really a woman. Omph. The boss explains that she wants to do the case so badly that he had to tell a little white lie. This makes Sarawat feel quite remorse and wants to apologize to her in person. But timing is not quite right so the boss tells him that he will introduce the Sarawat to Mee at the event tomorrow. Mee has decided to allow her nephew to live with her and she wonders to herself that if his grandpa and father is this evil, how horrible is this little guy going to be? Mee will find out soon enough. She is waiting for her nephew and mom at the train station, when a young girl runs right into her. She’s scared and frantic, then lies that a bad man is going to sell her off. Mee’s defenses are immediately up as she protects the girl. Sarawat Heran comes running after the girl and tells Mee to step away, but Mee starts hitting him with her newspaper. Sarawat finally apprehends her, but she starts screaming for help. He tells her that she’s ruining his police work- then his subordinates appear and asks him if she was their culprit, they thought she was supposed to be 15-16, lol. He releases his hold on her when she decides to take a breather. “Are you really a cop?” she asks. “Do you want to see my badge?” Sarawat questions with annoyance. He orders his subordinates to search for the girl. “Just the exterior. Next time you should take a good look around you first,” he lectures. He peers at her and returns her “weapon” (newspaper.) She apologizes again for ruining his investigation. He tells her to be careful next time when she steps in the line of fire, she might be burned. As she walks off, he stops to ask her if they’ve met before. “I don’t think so,” she replies. He seems to be satisfied with the answer. Ah, but you have. You are meant to be, you just don’t know that yet. Either that, or this drama lives in coincidence ville. Mee finally meets her nephew, who is a brat and a young thug. She chastises him to speak properly when he’s around her, she doesn’t care what impolite language he uses at his home. She’s turned into her aunt, ha! She further says that if he doesn’t clean up his behavior, then he can go right on back home because her home doesn’t welcome him. They barely arrive at her house when the boy spouts how old and ugly her house is. Her mom keeps apologizing on his behalf and telling her not to mind his words too much. Ah, he’s such a brat, he complains next about his room and that he doesn’t want to stay there in cases the ghost would haunt him. (And he’s speaking in impolite words again.) Mee threatens him that the ghosts that are currently residing in this house are polite ghosts and they won’t put up with his bad words, they would surely kill him. Ha. But at the end of the day, he’s just a scared little boy. Mee takes him to his school next, and he’s offended that it’s a school spearheaded by the temple. He’s expecting to go to some fancy school. She told him that she went to the same school, if he doesn’t like it, he can go back to his school where everyone loves him (I love her sarcasm.) He is to start school immediately. I love how their professions (Mee and Sarawat Heran) bring them to spontaneous encounters. A charity foundation calls Mee for a story about two Laotian kids who were saved from human trafficking. As Mee makes her way to interview the siblings, Sarawat spots her from the banister. He smiles when he realizes who she is. He waits for her at the parking lot after her interview and pretends to walk into her. Ha. Our guy’s got game! “Hello, what are you doing here?” he questions, pretending surprise. “No need to worry that I’m a drug dealer,” she replies. “More than you think,” she retorts. Oh you know how to win over a girl. She gives him her card. He tells her she has a pretty name, and wonders how she’s getting home? He offers to give her a ride. I LOVE him. “Then let me take you (at least to the bus station. )” He even tempts her by telling her that he has many data surrounding the case she was interviewing for. Totally speaking her language. It appeals to him because she cares so much about kids- but Mee tells him that she only cares about the kids who are bullied by adults. He asks her whether a cop who got bullied about reporters is pitiful or not. Ha. And they do, because it’s finally the charity fashion show that we’ve been teased about since Maya Tawan! The evening of the event arrives, Mee dons her pink dress, giving no care whether she’s pretty or not because she’s there to work. “It’s more like a coincidence,” she retorts. “A good coincidence,” he says. Hehehe. A big wig, Than Pirun, greets Mee and Sarawat, asked if the two has been introduced. Mee denies it, saying that she just met the man. Than Pirun reminds them that they’ve participated in a case together, and to Mee’s horror, this Sarawat is the one whom she abused two times in a row. Ha. Sarawat chuckles, just realizing that she’s the transgender he mistaken her for. They get officially introduced and Than Pirun (who’s Sarawat’s boss) mentions that Mee is not only a pretty reporter, but a very skilled one too. He invites her to stop by the station and see if any cases appeal to her, and offers the Sarawat to be used at her disposal. Heh. 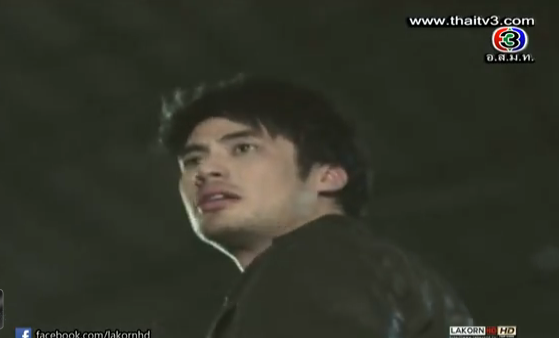 Sarawat jumps in that he’s happy to help so long as she doesn’t beat him like before, he’s still hurt. As the event (silk fashion show) proceeds, Sarawat watches Mee work, smiling all the while. Mee doesn’t fare well with a crowd of fangirls cheering their aunties on lol, so she side steps to the back of the crowd. By the time the event comes to a close, Sarawat offers her orange juice, as he has noticed she didn’t eat or drink this evening. Someone is keeping tabs of her. Sarawat learns that Mee is not too keen with fashion events. She has a cynical view, thinking that it doesn’t appear to be a charity event, more like people competing on who’s better. Sarawat says that he doesn’t enjoy these events all that much, but if you remove all of the pretenses, at the end of the day, what they do get is support and money to help them catch the offenders (drug dealers.) I love that he’s the glass half full kind of guy. She thanks him for giving her a positive perspective. He replies that if one were to look at things, one should evaluate it closely. Heh. There is a problem backstage that Heran needed to tend to, apparently one of the matrons (who’s doing the cat walk) refuses to walk because she would be accepting flowers from a woman who’s after her son. By accepting the flowers, it would mean she is accepting her as a daughter in law. Lol. The logic of some people! Heran tells her to stay put as he deals with the situation, but as he leaves, Mee wonders why she would need to listen to him. She takes off and walks into the same elevator as Muat Dao. When he returns, he finds her missing and calls her. She lies that she’s getting in the elevator (while Muat Dao is walking pass and knows that she’s lying) then she pretends to get bad cellphone reception, but Sarawat has been around the block a few times, he says he uses the same technique before too. Haha. She’s speechless and decides hanging up is her best bet. Mee comes home to find her bratty nephew still awake and watching the tv. When she shuts it off, the brat throws the remote at her. She tells him that she won’t be fixing that and this will be the last day he’s going to be rude to her. If he continues, she will punish him. Go auntie! Speaking impolitely, the boy doesn’t think she would dare do anything to him. Mee tells him not to test her. Mee walks into the kitchen and washes her hand with soap, she approaches the boy and washes his mouth with it! She tells him one last time that if he’s living under her roof, he best heed her rules- or else! He nods his head with concession and runs to his room in tears. Auntie wins round one! Mee tells her mom that if she’s being too harsh, she can take the boy back home. (Mom should be happy that someone is teaching him manners, otherwise he’ll grow up just like his father and grandfather.) But mom pleads for Tih to stay with her, that Tih is not as fortunate as other kids, or as Mee. 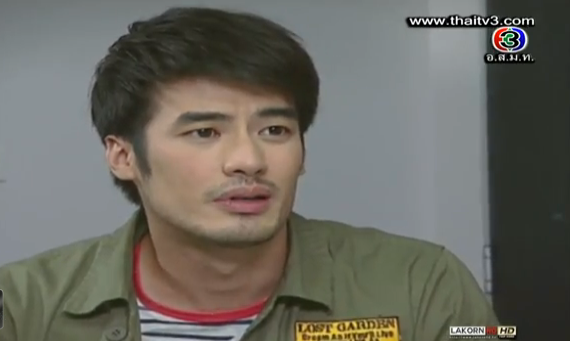 Her mom reasons that he can be stubborn because he just met his auntie, always defending the boy. “He’s spoiled rotten. Why hasn’t anyone disciplined him?” she questions. Again, her mom defends him. Mee eventually tells her to stop worrying, if he could heed her rules and discipline, he’ll be fine. As Mee washes the remaining soap suds from her hands, her mother had one more question for her. “Do you come home this late every night?” she inquires. “Ok, I was just worried. If you come home late like this every night, and I’m not here, how is Tih going to live?” eh, at the end of the day, she only worries about the boy. Sigh. And that, is the beginning of our family drama, which I’m sure, is going to worsen. But I want to see a poor relationship getting incrementally better as the series progress, and Tih getting schooled by his auntie. And what think you of our Sarawat Heran? I’m thinking this is a new pairing I can definitely get behind. I do love his character: persistent, endearing, and I’m sure, his guns are going to be quite handy down the road for our girl. It appears that this series will focus solely on the drama behind Mee, how she will overcome her family issues, her emotional handicap, and how Sarawat can open her heart. With this author’s track record, I’m not counting on dual character development, meaning that Sarawat himself will be that same, consistent guy from beginning to end, there won’t be a huge character arch for him, because his main role is making an effect on Mee’s life (and heart for that matter.) All I ask is that there are developments within our romantic relationship. Just give me the chemistry and I am a happy camper. For a first episode, I like that they don’t delve too much into her past right away. We have an idea what she went through, but the interesting part is to see how her past propels her to act a certain way in the future. Fia dear, this was fast! 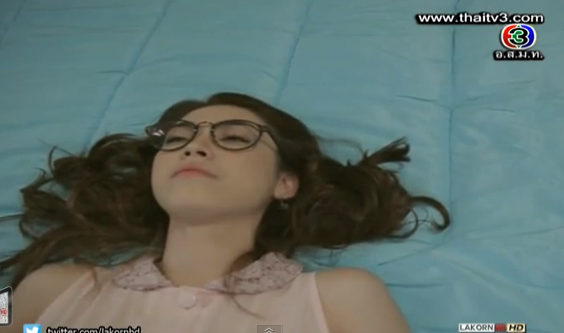 I was waiting for your recap and comments to fully understand the raw lakorn. 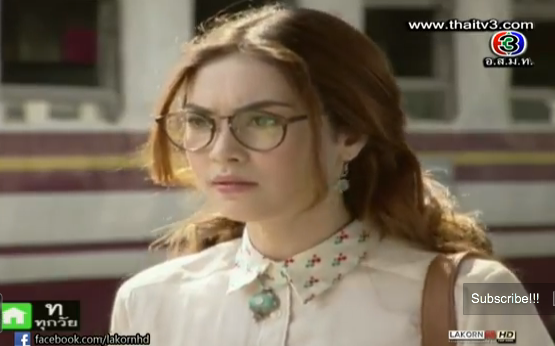 It looks like its going to be a good lakorn. Thanks. Yup,very fast post indeed. i think i’m gonna love this pairing as well. 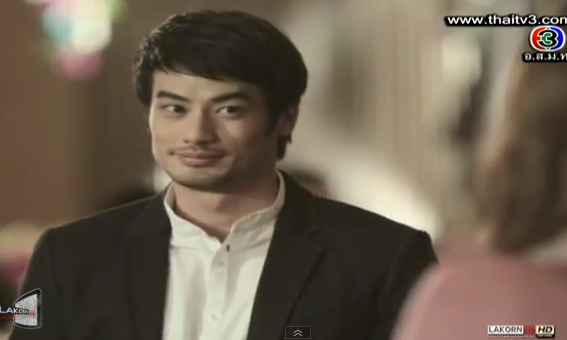 My still in my “Waree and Khun Sama” mode.Hopefully this couple will show us good chemistry. I’ve been following each of Boy’s lakorns since Roy Marn (i didn’t finish 4HHKK except for Thara Himalaya eps). He doesn’t have the typical pretty boy/handsome appeal, but he’s really charming and cute in this own way. And i think that his acting has improved. While Matt is very versatile, she can play any role. Thanks a lot Fia! Ha. I had some time earlier today to watch and recap. Tomorrow I have an offsite meeting, so recaps won’t be as fast, it has to wait until the evening. 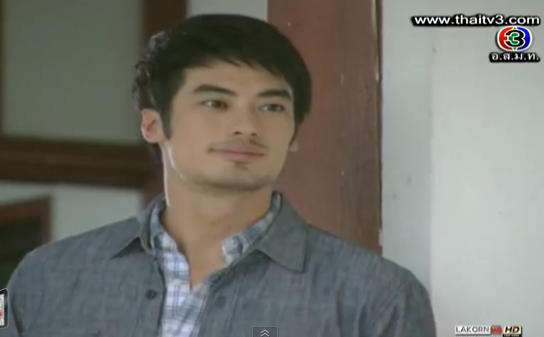 Boy Pakorn, in 4 Hearts made me want to slap him, but I loved him as Dr. Pathawee in Pon Prom Onlaweng, and now, well, so far I find him super cute (behavior wise) as Sarawat Heran, and with his charming acting, it makes him handsome to me. Fickle fan I am. I can pretty much find any actor ‘handsome’ if they are compelling in some way. And ditto, Matt is great in every character she portrays, but she won me over in Mam Gam Dang as Ana, which she played with Chakrit! Glad to hear all (fellow musketeers series follower) are enjoying MJT thus far, we shall see if they can keep it up! Thanks for your comments! I liked episode 1, so far. 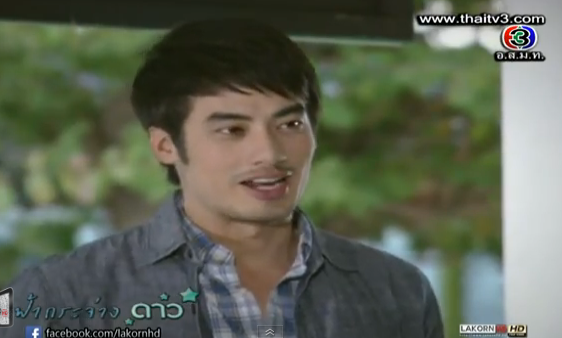 I love Boy Pakorn’s character. He just make me smile non-stop. It’s probably the way how he interact or should I said “hit” on Matt’s character. lol. That nephew is so RUDE!!!!!!!!! Everytime his scene is on I get so pissed off and annoyed by his rudeness toward his grandma and Matt. Especially towards Matt. Matt’s mom needs to stop spoiling him.